Saliva is essential to oral health and individuals who have too much or too little saliva can affect many functions, and may develop infections as a consequence of the reduced defenses. Saliva has many functions. Saliva helps us swallow, talk, taste and protect our mouth and teeth. Saliva not only physically removes dietary substrates and acids produced by plaque from the mouth, but it has a most important role in buffering the pH in saliva and within plaque. Fast-flowing saliva is alkaline and is vitally important in raising the pH of tooth plaque previously lowered by exposure to sugar and carbohydrates. Low pH can lead to demineralization of tooth substance which can initiate tooth decay. Saliva can also be used to detect drugs in our body system and it may also help in diagnosing certain diseases therefore do not underestimate this watery substance in your mouth. Drooling is defined as saliva beyond the margins of lips. The condition of increased salivary flow is termed sialorrhoea or ptyalism. This condition occurs in people at the extremes of age, the chronically debilitated or those in chronic care facilities, especially associated with stroke and esophageal cancer, are especially affected. Drooling is perfectly normal in healthy infants but usually stops by about 18 months of age and is considered abnormal if persists beyond the age of 4 years. However sleep drooling is normal especially if the person is a mouth-breather. Drooling is caused either by increased salivary flow (sialorrhoea) that cannot be compensated for by swallowing or by poor oral and facial muscle control in individuals with swallowing dysfunction (secondary sialorrhoea) or by anatomic or neuromuscular anomalies. Functionally – saliva soils the clothing of the person, peers, siblings, parents and caregivers as well as furniture. Clothing and bibs become soiled and need frequent changing. Clinically – unable to manage their oral secretions, affected persons are at increased risk of skin maceration (Softening due to soaking), infection and aspiration. Affected individuals may experience repeated skin breakdown and infections around the mouth. Aspiration-related respiratory and pulmonary complications are greatest in those with a diminished sensation of salivary flow and hypopharygeal retention. In rare severe cases, dehydration may become a problem. The impact of drooling on the quality of life is the most important factor in determining the need for treatment. The goal is to reduce drooling whilst maintaining a moist, healthy oral cavity. Treatment is best done by a team approach, including at least an otolaryngologist, neurologist, surgeon, dentist, orthodontist, speech, occupational and physical therapists. Treatment options include medical therapy, radiotherapy and surgery. Oral motor training exercises can be used to try to normalize muscle tone, increase lip closure and promote swallowing. Reducing cholinergic activity, either systematically (for example atropine-related oral anti-cholinergics) or more locally (for example sublingual ipratropium spray). Because of potential adverse effects, anti-cholinergic drugs are contraindicated in individuals with asthma, or ocular problems, such as glaucoma. 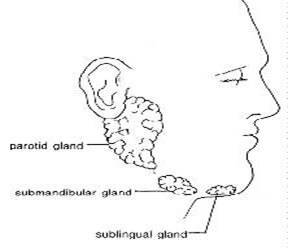 Botulinum toxin type A injected under ultrasound guidance into the parotid and submandibular glands. Irradiation of the major salivary glands has been used to decrease saliva secretion but has variable success and the potential risk of cancer later in life. Moderate to profuse or excessive drooling and in a patient whose cognitive function prevents use of conservative therapy. Surgical procedures used to control drooling are aimed at decreasing salivary flow or redirecting the salivary direct flow o a location more advantageous to promote swallowing and include salivary gland excision, duct re-routing, duct ligation, nerve sectioning, or combination of the above. This entry was posted in Oral Care and tagged drooling, drooling causes, excessive drooling, mouth drooling, ptyalism, saliva, sialorrhoea, sleep drooling on April 26, 2012 by oileng.